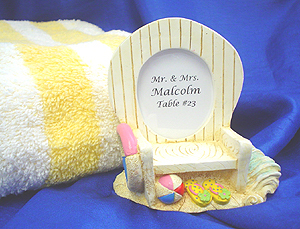 Beach chair favors include beach chair placecard frames and beach chair favor holders. Beach chair favors are very unique and make a great table presentation. The beach chair favors are perfect for those wanting a very unique beach wedding or beach themed event. 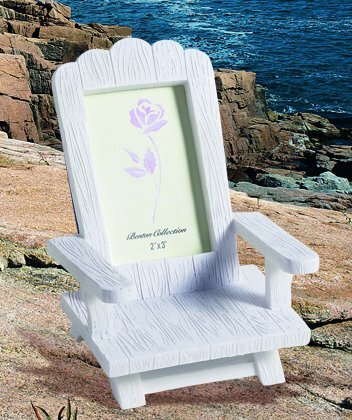 The mini adirondack chairs are very unique and one of the most popular beach favors for many years! Make sure to visit all of our beach wedding favors and nautical themed favors sections. 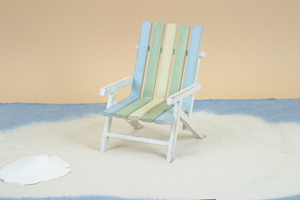 These adorable beach chair photo holders are perfect for your beach themed party favors. Each chair measures 4" tall and 3" wide. These beach chair photo holders are made of resin. The photo opening is sized to hold a 2" x 1.5" photo. Price is per beach chair photo holder. Minimum order is 12. Beach Chair Placecard Holders These cute beach chair placecard holders are made with real fabric and wood. They are packed flat in assorted colors as pictured. 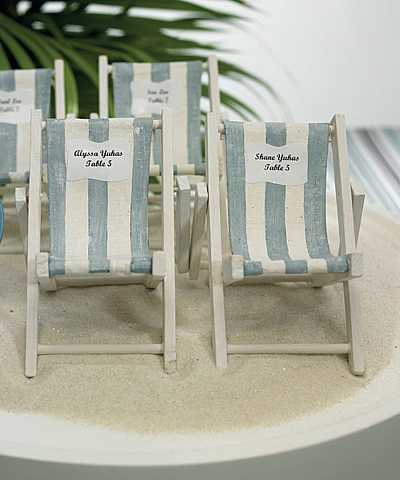 Each beach chair placecard holders features a little rope that can be used to hang the place card. 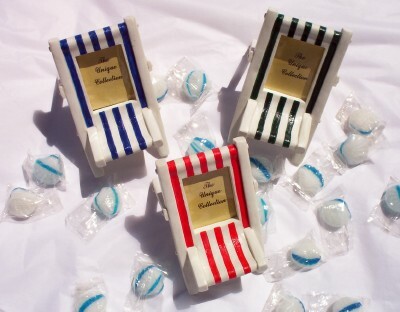 You can also use these beach chair place card holders to hold little candies, such as our seashell candy or pebble candy. Minimum order is 12chairs. Price is per chair. Mini Adirondack Photo Chairs These mini adirondack chair picture frames are great for beach themed wedding favors. They also make great table number holders or placecard holders. 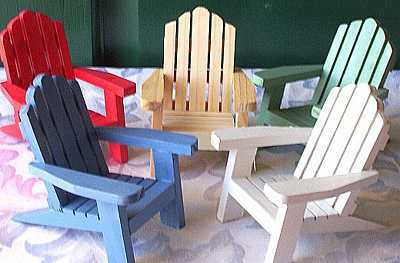 These miniature adirondack chair frames are handcrafted, hand painted, and provide a decorative touch to beach events. The chair frames are made of poly resin. They can be used later to display a photo. These chairs are white and measure ~ 4"x 4" with a 2"x 3" frame for a place card or photo. 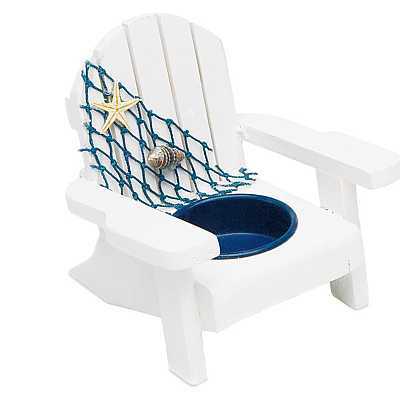 Please note that these are larger than the mini wooden adirondack placecard chairs. Great for beach placecard holders or beach wedding favors. Price is per chair. Minimum order is 14. 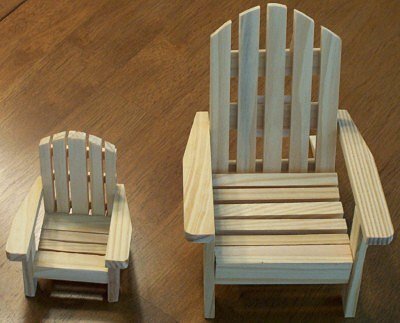 How cute are these mini vine adirondack chairs! 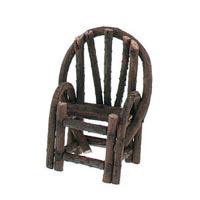 These chairs are the perfect addition to your rustic or lodge wedding or event. You can use them as place card holders or favor holders. They will also make great cake toppers. Each chair measures 2.75" x 3.75". Price is per chair. Must order in increments of 6. These sandwashed wooden beach chairs are perfect for table decoration. They can be used for table numbers at beach wedding favors. Each chair measures 7.5"H. Price is per sandwashed beach chair. Must order in increments of 12. Special order item. Wooden Deck Chair Candle Holder Wooden painted deck chairs can be used as place card holders and a unique favor by adding a kiss or a candle in the holder. Wow your guest by adding personalized decorations. 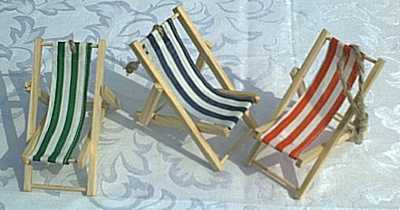 Measures: 3 3/4"H Price is per set of 4 wooden deck chairs. Minimum order is 3 sets.